ANN ARBOR, Mich., March 25, 2019 /PRNewswire/ -- Domino's Pizza (NYSE: DPZ), the largest pizza company in the world based on global retail sales, knows that some people practically live in their car, so why not make the car a great place to order pizza too? 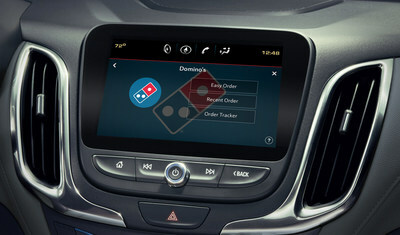 Domino's is working with Xevo Inc., the global leader of in-vehicle commerce and services for automakers, to launch the latest AnyWare pizza ordering platform pre-loaded in cars starting in 2019. The new in-vehicle Domino's app is powered by Xevo Market, an automotive commerce platform for connected cars. "At Domino's, we want pizza ordering to be simple and always within reach, no matter where a customer happens to be," said Chris Roeser, director of digital experience at Domino's. "This new AnyWare platform will make ordering pizza easy, whether you're in the car waiting for the kids to finish soccer practice or you're on your way home from work." Customers will be able order their Domino's favorites with just a few taps on their vehicle's touchscreen. Once the customer is logged in, they can save time by ordering their Easy Order or most recent order, and then track it with Domino's Tracker®, so they know when it's out of the oven. Customers can locate their local store and call in an order from the in-car interface as well. The Domino's ordering feature will be automatically loaded on millions of cars with the Xevo platform starting in late 2019. "We're excited to work with Domino's, and to have them join the Xevo Market platform, which is already live in millions of vehicles on the road today. Domino's is the world's largest pizza company, and they've always been technological innovators," said Brian Woods, chief marketing officer at Xevo. "Xevo Market makes it possible for Domino's to reach people directly in their cars, streamlining mobile ordering to help busy consumers save time."